It started with an idea. Sally Davies, an artist living in Manhattan, wanted to say something about the state of food in New York City. So, she headed to a random fast food place and picked up a meal. In this case, it was a McDonald’s Happy Meal. Six months later, and the food looks nearly as delicious as it did on the day she picked up the meal. 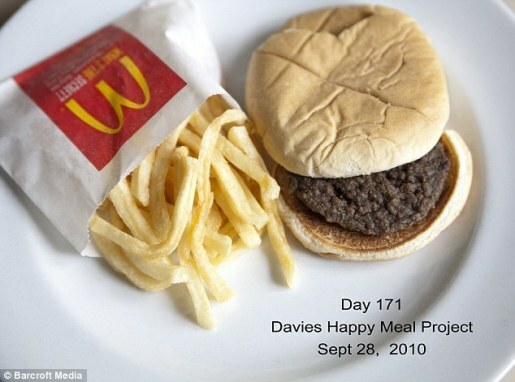 The Happy Meal Project charts the decomposition, or lack thereof, of an unrefrigerated Happy Meal. You can see the original below, and at the top of the post is the meal as of September 28. I know it’s bad for me, and I don’t care. Those fries look delicious, as does that burger. 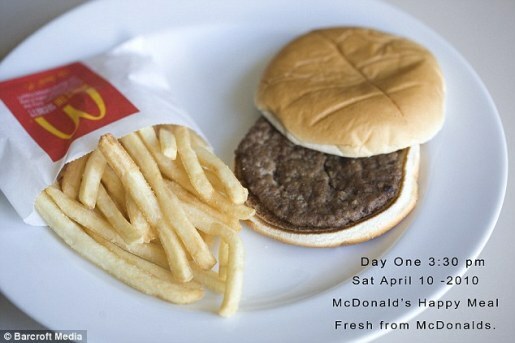 I hope I can resist the urge to get a McDinner tonight.